I'm a stay-at-home dad who home-schools my children. I wanted to start a reef tank initially to help my son learn about the ecosystem, but it quickly turned into my obsession! I definitely had a rough start with the tank since my LFS told me to fill it with tap water and just use Seachem Prime to start the tank. Who knows what issues that caused! I didn't know what direction I wanted to take the tank until I met another reefer at a party. Once he showed me his massive sps-dominant reef, I knew I had to master growing SPS. After a couple months of keeping low (ish) nutrient levels, my buddy gave me a couple of frags including a bubble gum monster chalice, a bali green slimer, and a Tyree pink lemonade. Although my reef experience has been dominated by my battle with dinos that lasted nearly a year, I did have some moments when the reef was doing quite well. During the lulls in the dino scourge, I would see great growth in my SPS, but in November of 2015 I botched my carbon dosing regimen and caused a fairly major STN event, taking out most of my acros. 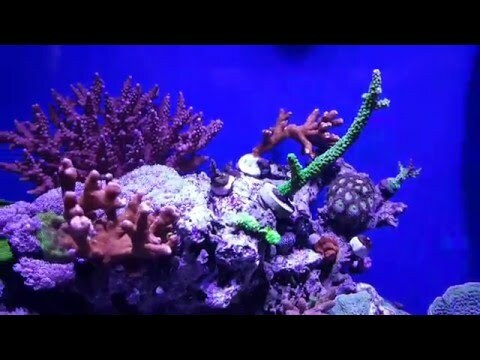 Now that I've eliminated my dino problem, I can refocus my efforts on growing coral again. I went to the full Zeovit system at the end of March and besides one of my more sensitive frags falling to RTN, it has worked well. I'm looking forward to seeing how much growth and color I can achieve in the next 5 months before I break down the tank and move out west to California! I use an Aquamaxx Cones HOB skimmer that now hangs on the side of my sump. I run dual filter socks in the sump which I change out twice weekly. I run Seachem Matrix carbon because the BRS ROX was just too aggressive. Lastly, I run full Zeovit with a 1 liter reactor from Fish Street and a Cobalt MJ1200 pump. I utilize a ball valve to control the flow through the reactor and I'm at about 30GPH right now. Porites Coral, Yellow Porites spp. I try to stay at natural sea water levels now because that is what Zeovit requires, but for quite a while I tried to maintain the high growth parameters that Red Sea recommends and what they provide with the RS Coral Pro Salt. What I found was that while I was dosing RS NO3-PO4-X it was virtually impossible to maintain such high levels without ill effect. Any time my Alkalinity went above 9dKH I saw bad things happen. This had more to do with me keeping very low nutrients while having a high alkalinity. RS states that to keep a high alkalinity (12.6 dKH), that the NO3 must be between 2-3ppm and the PO4 around 0.08ppm. No wonder then that I had issues! So now, I will maintain something a little closer to nature since that does seem to be the most effective way to grow coral. I want to keep it as simple as possible. I've had many instances where I dose too many things at once and can't keep track of the results. This hobby and this tank has taught me to slow down. Don't expect immediate results; there are always consequences for moving too fast...mostly of the negative variety. Funny that I like to keep it simple because now I run a Zeovit system that is highly dependent on additives. But because this is my somewhat experimental tank before I go for a bigger tank later, I want to dial in exactly what works for me. Being a stay-at-home dad affords me the time and access to give more attention to the tank so that not every detail has to be automated. Right now I don't mind manual dosing, but I imagine that will change when my tank is 10 times this size! On average you perform a 15.2% water change every 10 days.